Let's just get this out there: I don't plan. Really much of anything, ever. That means that I have a lot of flexibility both in terms of my actual schedule, and also in a more general, mental sense. It also means that sometimes I end up arriving in Austin, Texas on what is, totally unbeknownst to me, the final day of the renowned South by Southwest (SXSW) festival. Too late, in other words, to catch any of the movies or music, but just in time for it to be very difficult and expensive to find somewhere to stay. Austin has a reputation for being a great town, and indeed it does seem very nice, especially for someone who enjoys live music. But the citizens appear to be worried that Austin is becoming a victim of its own success, that outsiders are going to hone in and spoil the vibe. Everywhere you turn, there are t-shirts and bumper stickers which say "Keep Austin Weird." Driving my car down South Congress Street one morning I was even shouted at, "Go back to California!" Granted, that was probably someone who'd had it up to here with the SXSW inundation, but it still seems nicely demonstrative of what struck me as a rather quaint, provincial sort of protectionism. And here's the weird thing: Austin really isn't that weird. Even comparing it only to other cities of similar size, it strikes me as less funky and diverse and interesting than Minneapolis, say, or Portland. I think being an oasis in the middle of Texas has given them a different yardstick. A strong sense of pride (narcissism? ), however, seems to be common to the whole of Texas, at least if one is to judge by all the flag waving. I've lived most of my life in Minnesota, and I could not possibly tell you what the Minnesota state flag looks like. In fact, I couldn't even say for sure that there is a Minnesota state flag, though I assume there must be. 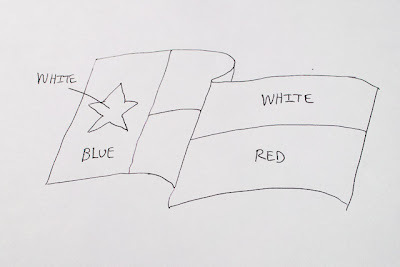 But only a couple hours after crossing the border I could have drawn the Texas state flag from memory if need be. 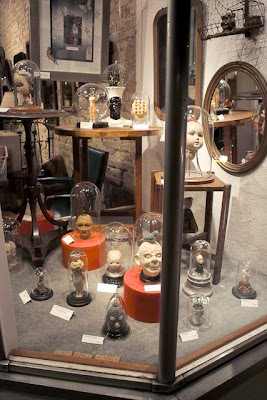 So... how much for the heads? Minnesota has a pretty lame flag. It's the ridiculously ornate state seal on a blue background. I managed to move to another state with a similarly lame flag. Washington's flag is a ridiculously ornate state seal on a green background. Woo hoo. The heads were surprisingly expensive actually, otherwise I might have picked one up. Hmm. I guess even if I'd ever seen the Minnesota flag I probably wouldn't have remembered it. Oh wow. That museum totally reminds me of the Sir John Soane Museum in London! Have you been there? It is awesome. I like Maryland's flag. You often find it as decoration at any RenFest. Ohio's flag is neat because it is a swallow-tail, not a rectangle. I have not been to the Sir John Soane Museum, it looks interesting. I'll put it on the list for the next time I'm in London, which I'm sure will happen sometime. Wow Chris, look at you with your state flag knowledge! I will probably catch a lot of flak for this post but I thought Austin was pretty lame. Sorry... Their were some highlights the LBJ Library was really quite nice. Did you know it is the only presidential library that is free. LBJ wanted it that way. We did get to one really good BBQ joint sorta out of downtown. Of course I can not remember the name. Oh yeah, Lance Armstrong's bike shop (Mellow Johnnys) was pretty cool and they were really great fixing my bike before the race I did down there. Oh yeah we also went to the botanical gardens and they were really nice. It was weird we were in this majorly dry brown city and landscape and then out of no where was this lush botanical garden. Very nice. Whole Foods was impressive it is their world head quarters. I have never seen such a sausage case in meat department. It was easily 30 feet long. So maybe I should revise my review. Naw... it was pretty lame still. I think I had Phantom Menace syndrome when I went down there. I expected too much..